A new Operations Director and a strategic investment drive is set to help a Kingswinford manufacturing specialist hit £1m within two years. Ace Forming, which is a critical partner in the development of formed precision metal components, has enjoyed a strong start to 2017 after securing new contracts to supply busbars for automotive and a range of innovative parts for the medical sector. It is looking to capitalise on this growth by appointing experienced engineer David Merchant to the senior management team and acquiring a new wiring machine and bead blaster to support an increase in prototyping and low volume production. The business, which was originally set up to produce parts for sister company Advanced Chemical Etching in Telford, is now on course to increase turnover to £750,000 this year, followed by £1m by the end of 2019. 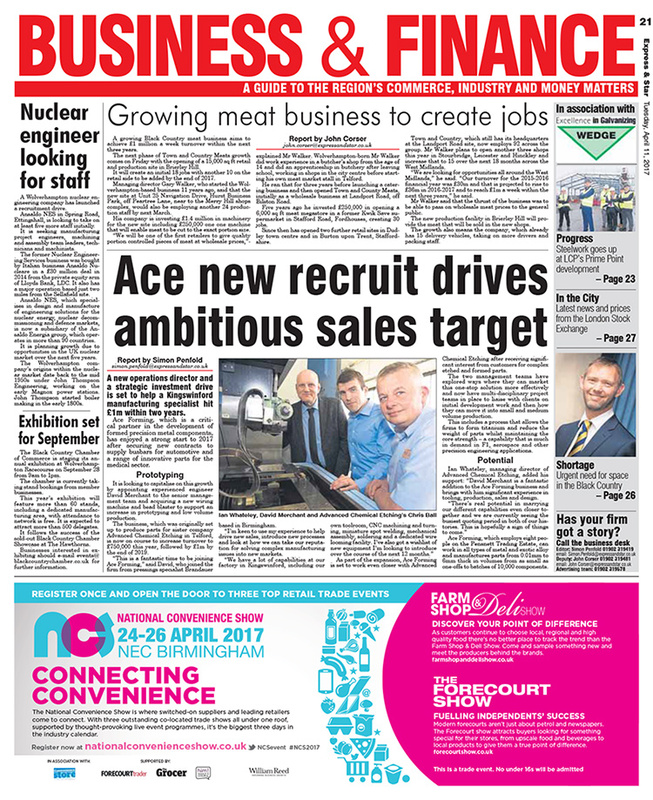 “This is a fantastic time to be joining ACE Forming and I’m keen to use my experience to help drive new sales, introduce new processes and look at how we can take our reputation for solving complex manufacturing issues into new markets,” explained David, who joined the firm from pressings specialist Brandauer. As part of the expansion, Ace Forming is set to work even closer with Advanced Chemical Etching after receiving significant interest from customers for complex etched and formed parts. The two management teams have explored ways where they can market this one-stop solution more effectively and now have multi-disciplinary project teams in place to liaise with clients on initial development work and then how they can move it into small and medium volume production. This includes a process that allows the firms to form titanium and reduce the weight of parts whilst maintaining the core strength…a capability that is very much in demand in F1, aerospace and other precision engineering applications. Ian Whateley, Managing Director of Advanced Chemical Etching, added his support: “David Merchant is a fantastic addition to the Ace Forming business and brings with him significant experience in tooling, production, sales and design. Ace Forming, which employs 8 people on the Pensnett Trading Estate, can work in all types of metal and exotic alloy and manufactures parts from 0.01mm to 6mm thick in volumes from as small as 1 offs to batches of 10,000 components. Click the image below Download the article PDF.